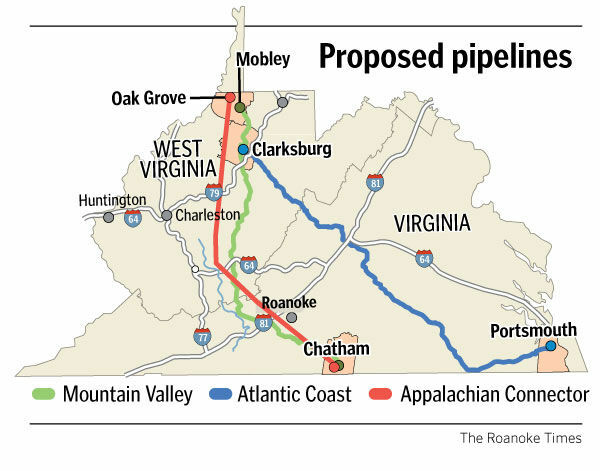 WAYNESBORO — A study requested by an Augusta County supervisor identifies potential risks of the Atlantic Coast Pipeline construction to county groundwater and surface water resources, and also measures the millions of gallons of water flowing from the county annually to adjacent counties. From compressor station emissions to damage from pipeline right-of-ways to the risk of explosions, transporting natural gas is a hazardous endeavor. The opposition to the expansion of the Algonquin Natural Gas Pipeline, managed by Spectra Energy, Inc., is growing, as the proposed upgrades to the pipeline become more imminent. Those opposed to the pipeline cite the fact that pipelines leak and sometimes even explode. Environmental advocates used their bodies to block entrances to the Federal Energy Regulatory Commission (FERC) on Monday and called for an end to its so-called rubber stamp polices. The agency issues permits to interstate natural gas pipelines, gas compressor stations and LNG facilities. The Department of Homeland Security (DHS) dispatched dozens of uniformed officers to manage the crowd, but for over an hour they were unable to remove the hundreds of protesters. There were 25 arrests and no reports of injuries. The Great March for Climate Action completed an eight month cross-country trek on Saturday, arriving at the White House. Enviros walked their last leg into Washington, DC escorted by nearly 200 people. As they walked from Maryland into DC, they chanted the names of the 11 states they had crossed over 8 months. They sang songs accompanied by guitars and spoke of their experiences. Their arrival marks the beginning of a week of climate actions across the region. As they arrived at the White House, they called on the administration to immediately begin fulfilling promises it made in 2008, to convert energy production to renewable sources–wind, solar and geothermal. They read aloud messages written by citizens from across the country. A common theme among them was time was running out to prevent more environmental destruction from fossil fuel energy. In a symbolic gesture of commitment to the environment, they hugged a giant hundred year old oak tree near the White House.